Generally, Terms & Conditions is a statement which includes rules by which one must agree to abide in order to use the services offered. These statement of agreement is very long. Hence, we have prepared a gist of the agreement for your convenience. Customer Satisfaction is our top priority. This website is for your personal use only and may not be used for any commercial purposes. Use of this website is subject to all of the Terms set out below - if you don't agree to the terms, please stop using the website immediately. It's your sole responsibility to ensure that the information you provide us when using any of our websites is accurate and complete. List of all of our group websites is mentioned at the end of the page. We may amend these Terms & Conditions at any time and without notice, by changing this page, so you are requested to check these Terms & Conditions each time you use the website. Loan Princess is a trading style of Tiger Lion Financial Limited. Tiger Lion Financial Limited is based in London as a credit broker. Our registered office address is 71-75 Shelton Street, Covent Garden, London, WC2H 9JQ. We are authorised and regulated by the financial regulatory body of UK which is Financial Conduct Authority, usually called as FCA. Our FCA Firm Reference Number is 753151. We are also registered with the Information Commissioners Office and our registration number is ZA185613. We are registered in England & Wales and our Company Number is 10189367. We carry out the business of credit brokerage in the United Kingdom. Our Company does not provide any loans or make any credit decisions. Tiger Lion Financial Limited is one-of-a-kind loan brokering firm which operates in the United Kingdom. Tiger Lion Financial Limited has built a revolutionary product called LoanTube and Loan Princess is powered by LoanTube. All loan applications received on Loan Princess are processed on LoanTube platform. LoanTube compares actual APRs (Annual Percentage Rate) and monthly repayments to ensure that you are not opting for any loan under a deception. This real-time loans comparison marketplace has a proprietary loan matching engine which connects the right borrower with the right lender. Any match made by LoanTube with any lender does not constitute any obligation on your side to accept the quotes offered by such lender/s. After receiving the quotes on the screen, it is totally your decision to accept any of them after reading the subjected conditions for such offered APRs and the features associated with such lender’s loan quote offer. Post acceptance of the quote, the processing of your loan application is between your’s and the lender’s control. You still have the chance to cancel or deny to proceed with that lender before you have signed any agreement or contract with that lender. The APRs and monthly repayments showed on our website or on LoanTube platform post processing of your loan application by us, are the rates which we guarantee to remain same post completion of your application with the lender unless otherwise the lender find some substantial information or any variance of the information provided which can make you look more riskier to the lender/s and thus they have to increase the rates/APRs to justify the additional risk found. At this stage you can opt to not to proceed with such lender. You are free to do that. In adverse cases where your application looks very riskier to lender at the time of making final checks, they can decline it and deny to give you the loan. In short, what you see on our website is what you get in real. Only exception to this is the adverse or hidden information which lender may find, about you, your financial associate or any linked person, during the detailed processing of your loan application. Beyond offering you the initial quote on our website or on LoanTube platform and your acceptance to it, lender may still perform a detailed credit check to see your credit history, verify you income & expenses, check your eligibility, affordability and your credit worthiness, check the information of yours’, your financial associates’ and any person linked to you in any way on all addresses you have resided on or linked to or associated to in any way. Your acceptance to use our service and to proceed with/acceptance to any quote gives us the right to authorise our partners to do so. We do not accept any responsibility for any of our partners or third party websites for any loss or damage that may arise from your use of their products & services, either directly or indirectly through us or independently. Our comparison service is free for you to use. We receive a fee or commission from lenders when you use us to find you a loan. Our customer service team is available to support with any queries. Loan Princess does not promise that completing an Application Form will result in you receiving a loan offer. Your request is not an application for credit from a specific lender or lenders but an expression of your interest in our service to compare the real rates from our partner lenders in order to find you a good loan deal. Any Representative APR examples of loan terms on our website and on our partners’ websites are for demonstrative purposes only. They may or may not be available to you. We reserve the right to amend, revise or update these Terms & Conditions from time to time by amending this page. The amended, revised or updated Terms & Conditions will be effective from the date they are posted on our website. Post any amendment, revision or update, if you continue using our website, it will indicate your implied accepted to the revised Terms & Conditions. We reserve the right to withdraw or amend the service we provide on our Site without notice. We will not be liable if for any reason our website is unavailable at any time or for any period. Our website is for your personal use only and you must not use it in any unlawful or fraudulent manner. By completing the Application Form you authoriseus to transmit your Application Form to our Partners to process your personal information and perform the checks necessary to find you a loan quote. You understand that these checks may include contacting Credit Reference Agencies (CRAs), fraud and money laundering preventing agencies and the electoral register as well as providing them with information about you. We and our partner lenders carry out the “soft credit search” on your personal information which you provide us. A ‘soft credit search’ or, as it is sometimes referred to, ‘quotation search’ is a search conducted by us or lender with a credit reference agency, such as Equifax, Experian or Call Credit. This helps us to identify and match you to the right lender/s and it helps the lender to determine whether or not they are able to provide the loan product or service. Unlike a ‘hard’ credit search, a soft credit search is recorded on your credit file, but only you can see it, rather than any other finance provider. A ‘soft credit search’ does not impact your credit worthiness. Our website, the content, any materials downloaded, and all intellectual property pertaining to or contained on our website (including but not limited to copyrights, patents, database rights, graphics, designs, text, logos, videos, illustrations, trade dress, trademarks,patents and service marks, (collectively ‘the Content’) is owned by Tiger Lion Financial Limited and all such rights are reserved. Duplicate, publish and modify any portion of our website for any public or commercial use without the express written consent from us. Remove or alter any author, trademark or other proprietary notice or legend displayed on our website or printed pages produced from our website. Make any other modifications to any documents obtained from our website other than in connection with completing information required to transact business with us. Create derivative works, participate in the transfer of or in any way exploit our website for public or commercial use. View or retain a copy of the pages from our website for personal but non-commercial use. View and make copies of relevant documents, pages or other documents for the purpose of transacting business with us. Any act done by you, for which you were required to seek written expressed permission and authorisation, if done without our written authorisation and permission, can result in a legal action against you. Requests for permissions and authorisation should be directed to [email protected]or Tiger Lion Financial Limited, 71-75 Shelton Street, Covent Garden, London, England - WC2H 9JQ, United Kingdom. Your use of any of our Partner/s or Provider/sor Third Party websites and your obtaining of any services will be subject to the Provider's, Partner’s &Third Party’s own Loan Princess and conditions, privacy & cookies policies (which will be different from ours). In order to familiarise yourself with the details of the service, it is advisable to go through the Loan Princess and Conditions, Privacy & Cookies Policy of the provider/lender/partner/third part. If you leave our website to complete the loan application on one of our Providers/Lenders websites, it is very important that you carefully read their Loan Princess and to make sure you fully understand and accept them. We do not accept any responsibility for any of our partners or third party websites for any loss or damage that may arise from your use of them. Therefore, you are advised to use any of our partners or third party websites after carefully reading their Loan Princess & Conditions, Privacy & Cookies Policies. We do not have any control on any content or resources for such third parties, their products or services, their websites or for any information, opinions or views given or advice provided by such third parties. Other third party websites are required either expressed, implied or written approval from us to link to our website. Any links to third party websites on our websites or in our emails are provided for your information, for your interest and convenience only. Any link to our website from any third party website is controlled by such third party only. You are advised to use any of our partners or third party websites after carefully reading their Loan Princess & Conditions, Privacy & Cookies Policies. We do not have any control on any content or resources for such third parties, their products or services, their websites or for any information, opinions or views given or advice provided by such third parties. We do not accept any responsibility for any of our partners or third party websites for any loss or damage that may arise from your use of them. All conditions, warranties and other Loan Princess which might otherwise be implied by statute, common law or the law of equity. As a result of your use, or inability to use our website due to circumstances beyond our reasonable control. This does not affect our liability for death or personal injury arising from our negligence, nor our liability for fraudulent misrepresentation or misrepresentation as to a fundamental matter, nor any other liability which cannot be excluded or limited under applicable law including but not limited to the Financial Services and Markets Act 2000, as amended, ("FSMA") or any conduct of business rules developed pursuant to FSMA. We do not give any warranty that ours’, our partners’ or third party’s websites are free from viruses or worms which may have a harmful effect on any technology or device being used while browsing through our website. By using our website, you agree to defend, indemnify, and hold harmless our company from and against any and all losses, claims, damages, costs and expenses (including reasonable legal and accounting fees) that we may become obligated to pay arising or resulting from your use of Our Website, Our Partners’ websites & Third Party’s Websites, the Content, or your breach of these Terms & Conditions. We reserve the right to assume or participate, at your expense, in the investigation, settlement, and defence of any such action or claim. Our service allows you to search & compare various types of loan products provided by Our Partners. You will need to answer a number of questions on the websites in order to compare or obtain a quote for any desired product. These questions are designed to ensure that we and all relevant partners/providers have all the information necessary to deliver you with appropriate and timely information relating to the products. It is therefore very important that you answer all of the questions truthfully, completely and accurately and that you disclose all relevant facts. In case, you have provided wrong information unintentionally, we request you to send us an email at [email protected]and we will update your corrected information with your consent. You must take all reasonable precautions (including using appropriate virus checking software) to ensure that any information, content, material or data you provide (including User Content) is free from viruses and worms which may have a harmful effect on any part of our website or the websites of our partners & third parties or any other technology. If you create any usernames and passwords when using our website, they must be kept confidential by you and must not be shared with anyone. You are solely responsible for any activity or activities undertaken on our website using your usernames and passwords. It is a sincere request to keep it safe and secured. The information on our website is not intended to be construed as financial or other advice. It is provided to help you find the product or service that you consider is the most appropriate for your circumstances. If you think you need financial advice, you should contact a registered and qualified Independent Financial Adviser (IFA). Our website must not be framed on any other site, nor may you create a link to any part of our website other than the home page. We reserve the right to withdraw linking permission without notice. Post: Tiger Lion Financial Limited, 71-75 Shelton Street, Covent Garden, London, WC2H 9JQ. The services and products that we provide on our website are intended for those over 18 years of age only, and information contained on our website does not amount to an invitation to clients who are under 18 to buy any services or products. All transactions for the supply of services concluded through our website are governed by the Terms & Conditions. Your use of our website and these Terms & Conditions (including any dispute or claim arising out of or in connection with our website, our partners & third parties) are governed & interpreted by the Laws of England and Wales whose courts have exclusive jurisdiction of any disputes that may arise under or in connection with the Terms & Conditions. You agree to submit to exclusive jurisdiction if you violate or breach any Terms & Conditions while accessing our website. We retain the right to bring proceedings against you for breach of these Terms & Conditions in your country of residence or another relevant country. This agreement is in English and all communications between you and us will be in English. If any provision of these terms and conditions is found to be unlawful, invalid or unenforceable, that provision shall be deemed deleted from these terms and conditions and shall not affect the validity or enforceability of the remaining terms and conditions. No failure or delay by us in exercising any of our rights under these terms and conditions shall constitute a waiver of that right nor will any single or partial exercise by us of any right preclude any further exercise of any right. You can also check us on FCA register by clicking on Tiger Lion Financial Limited. We are constantly evolving and learning. Hence, we would request you to drop your feedback, suggestions to us so that we can improve our services. If you are not happy with our services, please contact us, and allow us to offer you a concrete resolution. Post: Tiger Lion Financial Limited, 71-75 Shelton Street, Covent Garden, London, England - WC2H 9JQ, United Kingdom. We’d love to serve you! Loan Princess is resolute and earnest to your privacy. Because at the end of the day, we know, everyone is a customer, even we are. We also face issues with a few products or services and it feels really bad when the policies are not transparent. We don’t want to give this feeling to anyone dealing with us. Our mission is to spread smiles and happiness everywhere on this planet Earth. And we ensure you that we will do our level best to put that smile on your face. Learn how transparent we are because for us, YOU are the priority. Without you, we do not exist. And, we really mean it. Important Information: In compiling this Policy, we have taken steps to ensure we have integrated the standards and principles outlined in data collection and privacy frameworks, including the European Union’s General Data Protection Regulation (“GDPR”). What is Loan Princess ? Loan Princess is a trading style of Tiger Lion Financial Limited. Tiger Lion Financial Limited is based in London as a credit broker. There are a few important information about us which we will simplify and write in bullet points for an easy read. We have a lot of missions, one among them is a simplification. We are already making loans simplified, but apart from services, there are other things too. We will take care of everything. See, it was easy. Right? We told you, we will make it easier. Now you have all the necessary information about us. Technically, it was an introduction. If you are still reading on, then we would like to convey that we are glad to meet you (even though virtually). What do we do? We are a bunch of simple people with a common interest, that is, to make this world a better place. Moreover, wealso carry out the business of credit brokerage in the United Kingdom. Our Company does not provide any loans or make any credit decisions. We are easy people, dealings with us is much easier than it seems. We forgot to tell you! This policy should be read in conjunction with our Terms & Conditionsinto which this Policy is incorporated by reference. Tiger Lion Financial Limitedis one-of-a-kind loan brokering firm which operates in the United Kingdom. By calling ourselves “one-of-a-kind”, we mean it (we are not being repetitive here, but we are just ringing a bell). Now, you must be thinking that why are we claiming to be different? You’ve hit the bull’s eye. Everything about us is different in its own way. Right from the website, its content, and the services we offer. Tiger Lion Financial Limited has built a revolutionary product called LoanTubeand Loan Princess is powered by LoanTube. LoanTube compares actual APRs (Annual Percentage Rate) and monthly repayments to ensure that you are not opting for any loan under a deception. This real-time loans comparison marketplace has a proprietary loan matching engine which connects the right borrower with the right lender. In short, what you see on our website is what you get in real. Because we are real and our ethics don’t allow us to deceive our customers. 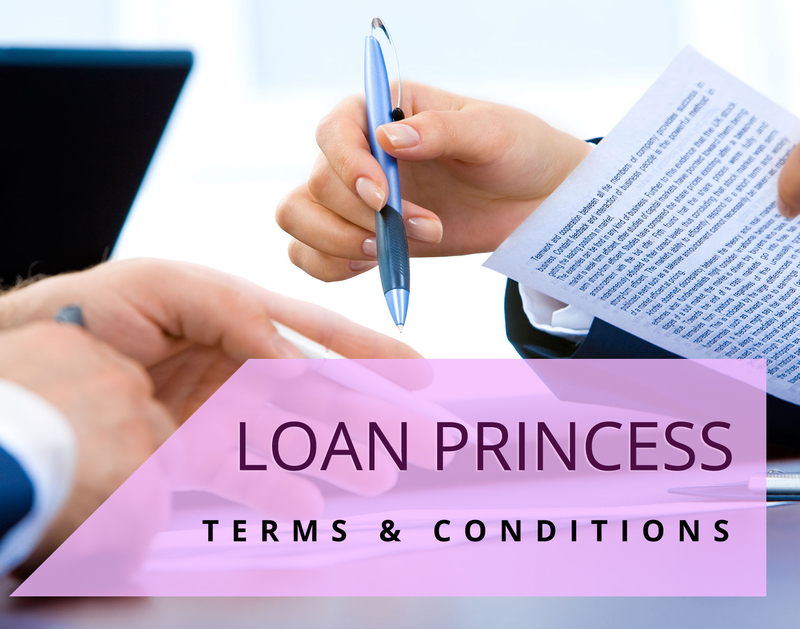 Here at Loan Princess , we place paramount importance in maintaining transparency and your trust. You are more valuable to us, Gurprit has already told you about the ideology that made him started this evolution. Do you need to know more? Please don’t hesitate from checking our Terms & Conditions and About Us for more information. Love Vintage? Here’s our postal address: 71-75 Shelton Street, Covent Garden, London, WC2H 9JQ. Besides, the right to privacy is a highly developed area of law in Europe. GDPR imposes stringent rules on the collection of personal information belonging to EU residents, including a requirement for privacy policies to be more concise, clearly-worded, and transparent in their disclosure of any collection, processing, storage, or transfer of personally identifiable information. Personally identifiable information can be used on its own or with other information to identify, contact, or locate a single person, or to identify an individual in context. Easier Version of the above definition: Personal information is data that can be used to identify or contact a single person. We may collect your personal information directly from you or via your use of our services. We may collect your personal information when you complete the online form available on our website. We may collect information when you contact or reach out to us by the modes of communication available for your convenience. We may collect information through Our Partners which includes Credit Bureaus, Third party data providers, Banks, brokers, lenders, advertisement networks, introducers, affiliates and others. By providing us with information about any other individual, you indicate that the individual has given you their explicit consent for the same. We sincerely request our users to provide us with the exact and accurate information, as this would be helpful for us to offer you a suitable loan. It is essential that personal information is accurate and kept up to date at all times to effectively conduct our business activities. Please contact us at any time to update your personal information, or to advise us that information held by us is inaccurate or incomplete. The first and most basic requirement is a point of contact. So, it includes your address (office or home), email address, contact number. Details in an address include House Number, Country, State or City, Postcode of Residence. This part of information would help us to carry out our search to present the best deals available for you on LoanTube. It includes monthly/annual income and spends, loan amount required by you, the purpose of the loan and the time period for loan borrowing. We also need to know where you work, your work profile and all similar information. This helps us in maintaining transparency. This includes employment status (if employed), monthly income, the name of your employer, an estimated amount of income per month (if self-employed). Let’s know each other. You already know who we are and what we do. We would also be glad to know about you. This information includes your name (first and last), date of birth, age, gender, marital status. Don’t worry, we don’t discriminate. We see all with the same eye and we treat everyone equally. God sees us all equally, so do we. This includes your preferences in receiving any marketing information, newsletters, promotional emails, or any similar information that speaks about our services. We will only collect personal information which is reasonably necessary for, or directly related to, the functioning of our services. The information collected is for the purposes of assessing your application for a loan, establishing your identity, contacting you, managing our risk and to comply with our legal obligations. We may collect your personal information for the purposes of direct marketing and managing our relationship with you. Improvements in technology also enable us to collect and use the information to get a more integrated view of our customers. We may also use personal information for internal purposes such as auditing, data analysis, and research to improve our services, and customer communications. From time to time, we may use your personal information to send important notices, such as communications about changes to our terms, conditions, quotations, reviews, feedback, and policies. Because this information is important to your interaction with us, you may not opt out of receiving these communications. Information collected may be used to manage, improve and safeguard our business and this website which includes data analysis, testing, system maintenance, research, support, reporting and hosting of data. Personal Information would help us to create and develop advertisements to you about our services and send you information about our services, any latest update. If you do not wish to receive marketing information, you may at any time decline to receive such information by calling us on 0203 633 1034 or by writing to us at [email protected]. Your personal information may be used in answering questions and responding to your requests with an intention to resolve your query/ies. Please note that if you ask us to delete your personal information before then our routine deletion period, it may still remain on our backup systems for only legal or other regulatory reasons. Our Partners who will help us to help you find the real rates/actual rates for the financial product or service you have asked us to help you find. Our partners comprise of a panel of lenders, Credit Bureaus, banks, brokers, introducers, affiliates & other data providers who are authorised and regulated by the Financial Conduct Authority to render their services. Our partners also include our other group websites with other trading names mentioned at the end of the page. Other Companies who enable us to provide our services, for example, IT Service Providers (who provide for e.g. technology platforms or other IT services including data storage), and communication providers (who provide for e.g. email and text services for customer contact verification and marketing purposes). Advertising Networks and Social Media companies such as Facebook, Google, Instagram, LinkedIn, Twitter, and YouTube so that we can present you with relevant advertisements. In order to facilitate our services, we may need to let them process your personal information. We will make sure that they keep the information secure and in accordance with our instructions, the General Data Protection Regulation 2016 (“GDPR”) and other UK privacy legislation. Also, we may share your personal information with any third parties to whom we may choose to sell, transfer, or merge parts of our business or our assets. We generally do not permit any of our external third-party suppliers to transfer and store customer data outside of the EEA. Some of our third-party suppliers may have a presence outside of EEA or their data processors may be based outside of EEA. Where this is the case and we are made aware of this, we will take all steps reasonably necessary to ascertain and seek assurance from any such third party that your data will be treated securely and provided no less security and protection than it would if it were stored in the UK. Where this is the case, we will make sure that they agree to: keep your personal information secure; apply the same levels of protection as we are required to apply to information held in the UK, and to use it only for the purpose of providing our services. We will do this by putting in place appropriate safeguards and protections as stated under UK law, for example using a data-transfer agreement incorporating certain standard model protection clauses. An HTTP Cookie contains a string of texts that has information about the browser. Each cookie is effectively a small lookup table containing pairs of values. Once the cookie has been read by the code on the server or client computer, the data can be retrieved and used to customise the web page appropriately. When your privacy is a matter of utmost concern for us then data security also holds the same level of concern. We take proper security measures to prevent your personal information from being accidentally lost, used or accessed in an unauthorised way, altered or disclosed. We will keep Your Personal Data secure in accordance with our legal responsibilities. Also, reasonable steps will be taken to safeguard your Personal Data against it being accessed unlawfully or maliciously by a third party. We expect you to take judicious steps to safeguard your own privacy when transferring information to us, such as not sending confidential information over unprotected email, ensuring email attachments are password protected or encrypted and only using secure methods of postage when original documentation is being sent to us. Your Personal Data will be retained by us either electronically or in paper format for a minimum of six years (as mentioned in the Information Retention), or in instances whereby we have the legal right to such information we will retain records indefinitely. (8) the existence of automated decision-making, including profiling, referred to in Article 22(1) and (4) and, at least in those cases, meaningful information about the logic involved, as well as the significance and the envisaged consequences of such processing for you. If you wish to avail yourself of this right of confirmation, you may do so, at any time, by sending us an email on [email protected] or by writing to Data Protection Officer at Tiger Lion Financial Limited, 71-75 Shelton Street, Covent Garden, London, WC2H 9JQ. You have the right granted by the European legislator to object, on grounds relating to your particular situation, at any time, to the processing of personal data concerning you, which is based on point (e) or (f) of Article 6(1) of the GDPR. This also applies to profile based on these provisions. Tiger Lion Financial Limited or any of its trading websites shall no longer process the personal data in the event of the objection unless we can demonstrate compelling legitimate grounds for the processing which override your interests, rights, and freedoms, or for the establishment, exercise or defense of legal claims. If Tiger Lion Financial Limited or any of its trading websites processes personal data for direct marketing purposes, you shall have the right to object at any time to the processing of personal data concerning you for such marketing. This applies to profile to the extent that it is related to such direct marketing. If you object to Tiger Lion Financial Limited or any of its trading websites to the processing for direct marketing purposes, Tiger Lion Financial Limited or any of its trading websites will no longer process the personal data for these purposes. In addition, you have the right, on grounds relating to your particular situation, to object to processing of personal data concerning you by Tiger Lion Financial Limited or any of its trading websites for scientific or historical research purposes, or for statistical purposes pursuant to Article 89(1) of the GDPR, unless the processing is necessary for the performance of a task carried out for reasons of public interest. In order to exercise the right to Object, you may contact us by sending us an email on [email protected] or by writing to Data Protection Officer at Tiger Lion Financial Limited, 71-75 Shelton Street, Covent Garden, London, WC2H 9JQ. In addition, you are free in the context of the use of information society services, and notwithstanding Directive 2002/58/EC, to use your right to object by automated means using technical specifications. You have the right to obtain from us, without undue delay, the rectification of inaccurate personal data concerning you. Taking into account the purposes of the processing, you have the right to have incomplete personal data completed, including by means of providing a supplementary statement. You withdraw consent to which the processing is based according to the point (a) of Article 6(1) of the GDPR, or point (a) of Article 9(2) of the GDPR, and where there is no other legal ground for the processing. You object to the processing pursuant to Article 21(1) of the GDPR and there are no overriding legitimate grounds for the processing or you object to the processing pursuant to Article 21(2) of the GDPR. The personal data must be erased for compliance with a legal obligation in Union or Member State law or any law to which we are subject. If one of the aforementioned reasons applies, and you wish to request the erasure of personal data stored by Tiger Lion Financial Limited or any of its trading websites, you may, at any time, by sending us an email on [email protected] or by writing to Data Protection Officer at Tiger Lion Financial Limited, 71-75 Shelton Street, Covent Garden, London, WC2H 9JQ. Data Protection Officer of Tiger Lion Financial Limited shall promptly ensure that the erasure request is complied with immediately. Where we have made personal data public and are obliged pursuant to Article 17(1) to erase the personal data, we, taking account of available technology and the cost of implementation, shall take reasonable steps, including technical measures, to inform other controllers processing the personal data that you have requested erasure by such controllers of any links to, or copy or replication of, those personal data, as far as processing is not required. Data Protection Officer of Tiger Lion Financial Limited will arrange the necessary measures in individual cases. You have the right granted by the European legislator, to receive the personal data concerning you, which was provided to us, in a structured, commonly used and machine-readable format. You have the right to transmit those data to another controller without hindrance from us to which the personal data have been provided, as long as the processing is based on consent pursuant to point (a) of Article 6(1) of the GDPR or point (a) of Article 9(2) of the GDPR, or on a contract pursuant to point (b) of Article 6(1) of the GDPR, and the processing is carried out by automated means. In order to assert the right to data portability, you may, at any time, contact us by sending an email on [email protected] or by writing to Data Protection Officer at Tiger Lion Financial Limited, 71-75 Shelton Street, Covent Garden, London, WC2H 9JQ. The processing is unlawful and you oppose the erasure of the personal data and requests instead of the restriction of their use instead. We no longer need the personal data for the purposes of the processing, but they are required by you for the establishment, exercise or defense of legal claims. You have objected to processing pursuant to Article 21(1) of the GDPR pending the verification whether the legitimate grounds of ours override those of yours. If one of the aforementioned conditions is met, and you wish to request the restriction of the processing of personal data stored by Tiger Lion Financial Limited or any of its trading websites, you may at any time contact us by sending us an email on [email protected] or by writing to Data Protection Officer at Tiger Lion Financial Limited, 71-75 Shelton Street, Covent Garden, London, WC2H 9JQ. The Data Protection Office of Tiger Lion Financial Limited will arrange the restriction of the processing. We will try to resolve any complaint that you may have in relation to data protection issues. If you are not happy with our response or if you have any concerns or complaints as to how we have handled Your Personal Data you may lodge a complaint with the UK's data protection regulator, the ICO, who can be contacted through their website at https://ico.org.uk/global/contact-us/ or by writing to Information Commissioner's Office, Wycliffe House, Water Lane, Wilmslow, Cheshire, SK9 5AF. In case you need to understand the mechanism of our data collection, usage, violations, security and any other data security-related information, or if you have any concerns about how we have handled your personal data, you are requested to contact our dedicated Data Protection Officer. A DPO is a nominated officer oversees data protection strategy and implementation to ensure compliance with GDPR requirements. How do we use a cookie? Oh! We love chocolate chip cookies with honey all over it. Wait? Are we discussing the policy regarding HTTP Cookie? These cookies allow us to distinguish you from other visitors to our website which helps us to provide a personalised experience. Um, we haven’t baked one recently. But we know that a cookie needs graham crackers, sour cream, dried cranberries, cornflakes, ground coffee, milk, cheese and a lot of chocolate chip sprinkles. Yum. No? uh-oh! HTTP Cookie? Okay, let’s get back to the business. A cookie of a shopping cart in an online shop. The online store remembers the articles that a customer has placed in the virtual shopping cart via a cookie. And when the customer finishes the shopping, he can usually check his cart virtually, select and deselect items and proceed. See, it makes jobs of both the customers and the service provider easier and saves a great deal of time which one can invest in munching on a cookie (we are going mad over cookies now). No, we don’t stalk you. Because these small files are required to provide you with the best user experience and also tells us which pages you find most interesting (anonymously). Isn’t that just great? Mostly, people freak out about cookies. But they are not harmful. You know, you can always trust us. We are here to take you out of your problems, and we do so at each and every step. A promise is a promise. We have categorised our cookies into four (4) different sections based on their usage and functionality. The cookies we use may change over the period of time. Any revision in policy will be updated because we don’t want you to miss out on anything. These cookies are quintessential as it enables you to browse through our website and use different features available on it. You will not be able to use certain features of our website if you disable these cookies. And yes, Milk and Belgian Chocolate cookies are also essential for our existence. Without them, we may not function. As the name suggests, these cookies are used to optimize the performance of the services we provide. The cookies involved in this section collect information about website usage patterns and trends. This will help us to understand your browsing behaviour and will allow us to optimize it further to make it easier for you. Co-founder of Google, Sergey Brin said, “We want Google to be the third half of your brain”. And it has developed some of the most essential tools for the development of the human race. Google Analytics is one of them. Sergey Brin’s actual name is Sergey MikhaylovichBrin who is an American computer scientist and internet entrepreneur. He is the President of Google’s parent company Alphabet Inc.
Google Analytics is a web analytics service of the Google LLC, 1600 Amphitheatre Parkway, Mountain View, CA 94043-1351, United States. Via this technology, we collect and analyse data about our visitor’s behaviour. The data collected is anonymous and we use it for the optimization of our website. We use the function anonymizeIP, which anonymizes your IP-address before the data is transferred to Google’s servers in the United States of America. By setting the cookie, Google may analyse the use of our website. Therefore, Google gains knowledge of information, such as the access time, the location from which the site was accessed and the frequency of visits to our website by the data subject. With each visit to our website, data will be transmitted to Google in the USA. Google may store and pass these personal data collected through the technical procedure on to third parties. Please note: Performance cookies DO NOT collect information that identifies you. And information collected by these cookies is anonymous. Functionality Cookies help us to remember your settings, preferences, and all such relevant choices that you make during your browsing experience. In order to make your experience completely exceptional and user-friendly, these cookies are important. The last cookie on our plate is this one. This time we are talking about an HTTP Cookie only. Because our team can never run out of cookies. Thanks to Gurprit. We use re-marketing cookies via Google to serve more relevant adverts on third-party sites to users that have visited our site in the past. If you wish to opt out of re-marketing, please visit http://www.google.com/ads/preferences/ on Google and change the settings of your ad preferences, as per your convenience. Cookies are necessary as it allows us to improve the website and performance. Disabling them may restrict you from using certain parts of the website. But if you are still considering to disable these small files, manage your preferences in the browser and “block cookies” in the privacy pane. Picking the right loan for you can be tricky enough without feeling overwhelmed by the range of financial jargon surrounding these products. APR: APR stands for Annual Percentage Rate and is revealed by lenders before lending credit cards, loans and mortgages. The purpose of an APR is to show the total cost of borrowing over the period of an year. The figure includes cost of interest, upfront fees and charges for an average year. Knowing APR % of a loan makes it easier to compare deals. Car loan: A short-term personal loan advanced to buy a car is a car loan. It works in a similar fashion to standard personal loans, with repayments subject to interest over a fixed number of years. CCJ: This stands for a County Court Judgement (CCJ). It is issued by a County Court for failing to repay a loan or outstanding debt, and will have a negative impact on your credit rating and may affect your ability to get a loan or mortgage. Credit rating: This is the 'score' given to you depending on your personal credit history. So if you've always kept up repayments on any form of credit you've had, you'll have a good credit rating, whereas if you've failed to meet payments or, say, have a CCJ against your name, your credit rating is likely to be poor. Debt consolidation loan: This is one large loan taken out to pay off a number of loans or debts, so borrowers can manage their repayments and get back on track. Early repayment penalty: An additional fees may be charged by the lender if you decide to pay off your loan early, i.e., before the term set in the loan agreement. It usually applies to mortgages. Hire Purchase:A way of buying goods, such as a car, without the total cost to hand, and making instalments over a certain time period. Payday loan:A short-term small loan – of, say, £100 over two weeks – with a typically very high interest rate as an advance on your salary payment. Secured loan:This is a personal loan secured against an asset, such as your home. Given they come with security – so if you fail to make repayments your home could be at risk – the interest rates tend to be lower than for unsecured loans. Unsecured loan: This is a personal loan taken out by a borrower over a fixed term, and available from a bank, building society or high street lenders without security. You agree to borrow a lump sum and make regular repayments to the lender. Whatever financial product you're choosing, it's important to understand the fine details to ensure you're picking the right one. It is important to know what you're signing up for, so make sure you get to grips with Terms and Policies.